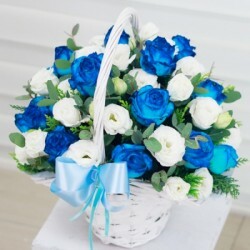 Blue roses do not occur in nature, at least not the absolute blue roses. Roses lack the pigment that produces the blue color. 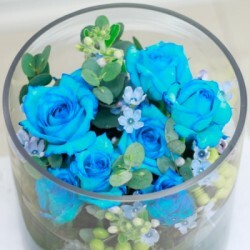 Our blue roses have been painstakingly created and imbued with a special meaning. The blue rose is in itself something very extraordinary expresses that very same feeling. "You are extraordinarily wonderful", the blue rose exclaims. A truly wonderful personality, almost chimera-like is what the blue rose says about the receiver. A flight of fancy, an irrepressible imagination is what the blue rose is all about. The rainbow rose is a rose which has had its petals artificially colored. The method exploits the rose's natural processes by which water is drawn up the stem. By splitting the stem and dipping each part in different colored water, the colors are drawn into the petals resulting in a multicolored rose. Blue & special Rose There are 7 products. You can choose such a beautiful blue and white in a basket here. For beautiful and precious moment forever! 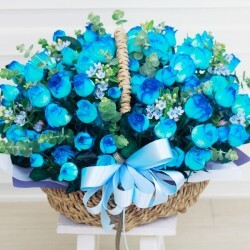 Product consists: Blue roses with Oxypetalum, Eucalyptus. Dimension: 60 * 60 cm Please note that this item available in Seoul Metropolitan and Kyung-gi area only. You can choose such a beautiful blue and white in a vase here. For beautiful and precious moment forever! 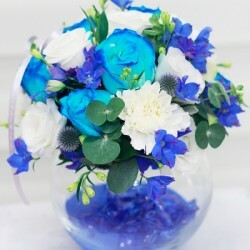 Product consists: Blue roses with Carnation, Lisianthus, Echinops, Delphinium. Dimension: 20 * 25 cmPlease note that this item available in Seoul Metropolitan and Kyung-gi area only. You can choose such a beautiful blue and white in a basket here. For beautiful and precious moment forever! 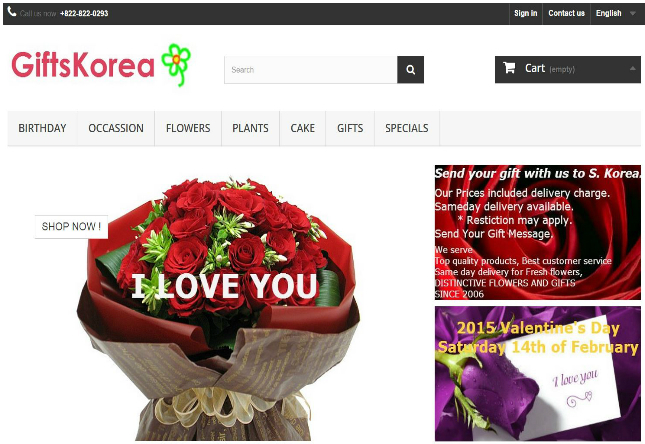 Product consists: Blue roses with Lisianthus, Oxypetalum, Eucalyptus. Dimension: 30 * 30 cmPlease note that this item available in Seoul Metropolitan and Kyung-gi area only. You can choose such a beautiful blue and white in a basket here. For beautiful and precious moment forever! 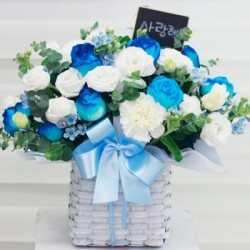 Product consists: Blue roses with Oxypetalum, Moss, Eucalyptus. Dimension: 20 * 30 cmPlease note that this item available in Seoul Metropolitan and Kyung-gi area only. You can choose such a beautiful blue and white in a basket here. For beautiful and precious moment forever! 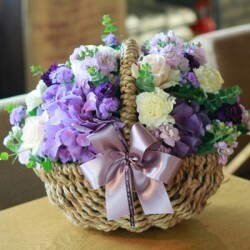 Product consists: Blue roses with Lisianthus, Eucalyptus. Dimension: 35 * 35 cmPlease note that this item available in Seoul Metropolitan and Kyung-gi area only. You can choose such a beautiful blue and white in a vase here. For beautiful and precious moment forever! 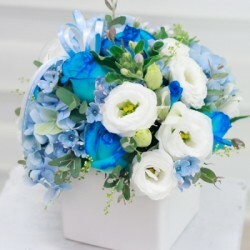 Product consists: Blue roses with Lisianthus, Oxypetalum, Eucalyptus. Dimension: 20 * 20 cmPlease note that this item available in Seoul Metropolitan and Kyung-gi area only.